Cardinal Cushing Centers has partnered with Hanger Orthotic Clinic to provide an orthotic clinic at our Hanover campus. Our goal is to provide assistance for our students who may benefit from extra support at their feet. 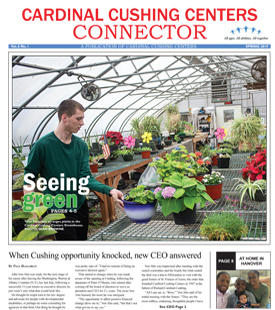 Students at Cardinal Cushing are very active during their school and vocational activities. At times, students may need this extra support due to their foot structure, alignment, muscle tone, or gait pattern. By providing an orthotic clinic on campus, our hope is to assist students and families who live far from campus or whose students may have difficulty attending medical appointments for a variety of reasons. Optimal foot alignment is the foundation for movement. Having a stable base helps to prevent injury, provide comfort, and maintain an active lifestyle. Orthotics can alleviate areas of pain and accommodate or correct deformities to improve overall alignment of the foot and ankle. The ultimate goal is to stop discomfort, pain or injury before it occurs. Hanger Clinic is the largest prosthetic and orthotic provider in the world and luckily has two local clinicians, Brian Heckathorn CPO and Anne Rowell MS, OTR/L, CPO who will be providing assessments with physical therapy clinicians here at our Hanover school. If you would like more information or to have your son or daughter scheduled for the clinic, please contact the physical therapy department at 781-826-6371 x 1280.